There's this great program that is happening at the School. Music in the School's, Donna Briesemeister has a multi-generational band going. With the contributions of instruments from Islanders Diane Kahlscheuer, Carol Amadio, and Barbara Greenfeldt, 10+ adults currently participate along with their school age peers and they are having lots of fun! There are folks playing trumpets, flutes, clarinets ... even a sax, a trombone and a violin. An instrumental music program is taking hold. Through the Music Fest, a grant has been received from the Door County Community Fund to cover sheet music and director's time. They are meeting every Wednesday after school... which allows music students who have had entry level training to transition into making music with a group. I have heard there are other adults who are dusting off their instruments and taking a few lessons in order to join the group up at the School. Students, no matter what age.....having lots of fun...making more than a joyful noise...They report that what I will call "lip power" is taking a while to get in shape and lung power is in development. It's a game and gutsy group and their music can't help but bring a smile to listeners and participants alike! The toe tapping... er... rythym is coming along... but there is something missing from the picture...instruments...more instruments! In order to encourage more student participation - more instruments are needed. Joanne Jack did a wonderful article in the Observer several weeks ago and in it she put out a call to all to check likely spots... ...So as the Holidays approach and decorations are retrieved from attics, hall closets, or other hiding places keep an eye open for an instrument case that might be hiding. Donna says whatever is discovered is worth contacting her at 920-847-2330. Replies are welcome below in the comment section or emails can be sent to me. My hope is to get the word out through this post to another set of readers who might like to contribute or lend an instrument or two. Other ideas or resources are welcome. So while there may be difficulties in getting a program started, there are also opportunities for music lovers out there - to clear out some space and share the cherished experience of making music with a new student. Another Musical Note! Julian returns to the Trueblood Performing Arts Center this coming Saturday! One more thing...Okay, so it isn't quite music oriented but it is worth planning ahead and marking your calendar for the Local Island Art and Craft Sale coming on Friday, November 23. There might be a CD or two available in staying with my music theme. 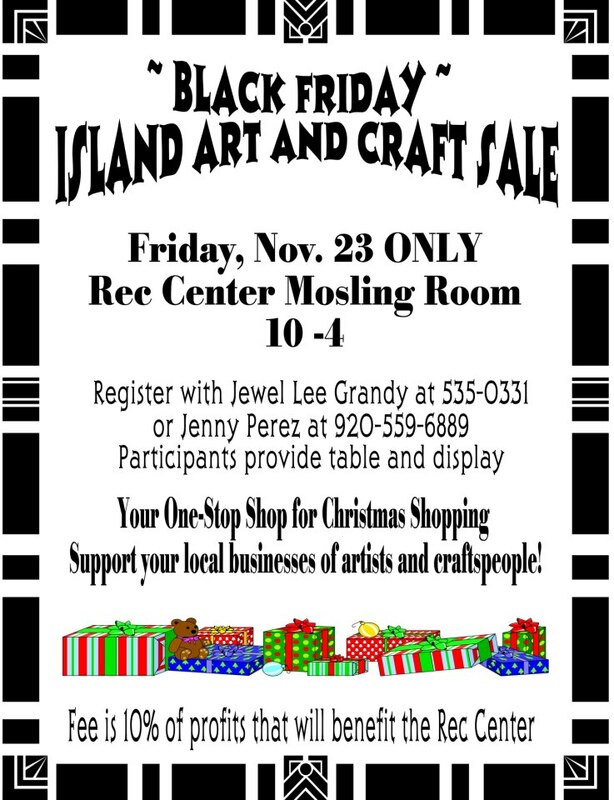 I can only imagine some of the lovely things Island artists will have on display for your shopping pleasure.